Urban Muser: hitting the streets! While I loved getting away to Maine last week, it was also wonderful coming home! Truth is, I am a city girl at heart and there are only so many days I can go without a taste of the hustle-bustle of the streets of NYC. These first three photos were taken on Bowery Street. There is a lot of good street flavor and character on the Lower East Side...there is an interesting photo everywhere you look. I can't remember where I took this next one--I think it was Prince Street a few blocks off Bowery. A totally different scene, but just a few blocks away. This last one was taken with my iPhone. 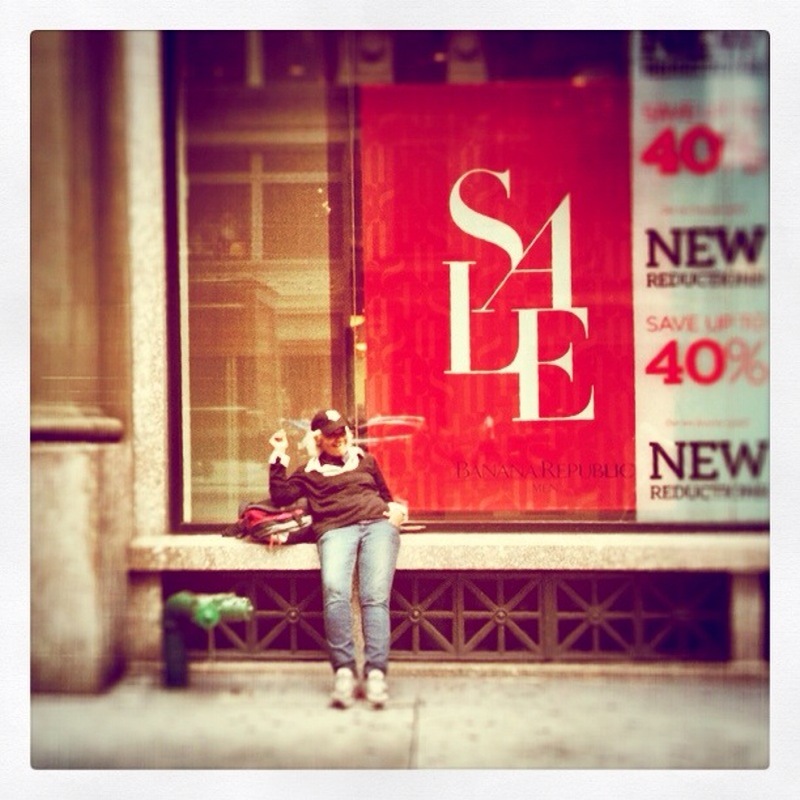 I couldn't resist this woman taking her smoke break on the window ledge of the Banana Republic on 5th Avenue. Great shots although I have to agree with the first one...I miss the old NY too. Love that you have NY to explore and share with us. VERY cool pics. Glad you had a nice time in Maine and are back home safe & sound. Thanks so much for linking up! These are all such wonderful shots - I love your perspective! You really manage to capture the energy of the city for me. :) Glad you're back! What a beautiful sense of place you've captured! It's amazing to be inspired by surroundings. I love that last shot especially. NYC looks amazing, i love you city photography. Glad you enjoyed visiting Maine. I too like your city shots though. The first is my favorite, but that last one with the reclined woman next to the sale sign is super as well. I always love the images you share! I feel like I'm right there with you in NYC. I can't wait to go back! Love, Love, Love the street art. Ah, how I love the city! Hope you had a wonderful trip, U.M. - although I've got to admit I'm very happy your back shooting in NYC - awesomeness! Great moments captured here - I really love the last one too - her face is priceless.